I have to start this review with a small confession: The TiVo app is fantastic for messing with your kids while they’re watching TV. For the first ten minutes after I installed the app from TiVo on my iPad, I drove my son absolutely nuts as I paused, rewound, changed channels, and, in myriad other ways, messed with what he was watching on TV. He was going nuts, fully convinced that there was something wrong while I was nearly in tears sitting at the desk behind him. General hijinks aside, the TiVo app for iPad offers an excellent way for you to find shows to record, manage your TiVo to-do lists and season passes, and, as my son learned indirectly, change channels, pause and play recordings, open the TiVo Guide, or do anything else you would normally do with your TiVo remote. In Control: TiVo’s iPad app gives you full control over your TiVo Premiere, letting you find, record, manage, and play all your TiVo media. When you open the TiVo app, there are five small buttons at the bottom of the iPad display that correspond with TiVo’s TV menus: Info, Guide, My Shows, Browse, and Manage. Info displays information on what’s currently playing on your TiVo. The guide displays a list of all your available TV channels. My Shows displays a list of all your saved recordings. Browse provides a link to content information provided by TiVo, such as movies and TV shows that are popular at the moment. Manage lets you manage your TiVo to-do lists and season passes. At the top of the TiVo app is a search field that you can use to find content and a button that opens a TiVo remote. The remote offers two interfaces for controlling your TiVo, one looks and works like your physical TiVo remote and another that lets you control your TiVo using gestures. Like gestures used on a trackpad, this remote lets you tap and swipe your fingers across your iPad display to control what happens on your TiVo. While I was very satisfied with the way the TiVo app worked with my TiVo Premiere, I was disappointed to find that it could not be used with my older Series2 TiVo, something I hope that the TiVo app offers in the future. 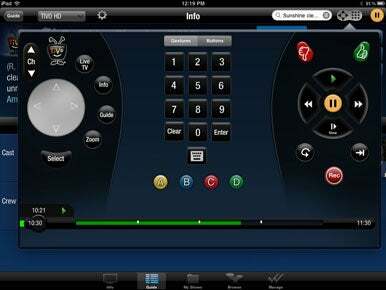 At present the app only works with TiVo Premiere and TiVo Premiere XL devices. That shortcoming aside, the TiVo iPad app is an excellent remote and is much better at managing your TiVo than the onscreen controls and the remote that ships in the box. And, of course, it’s great for practical jokers, too.